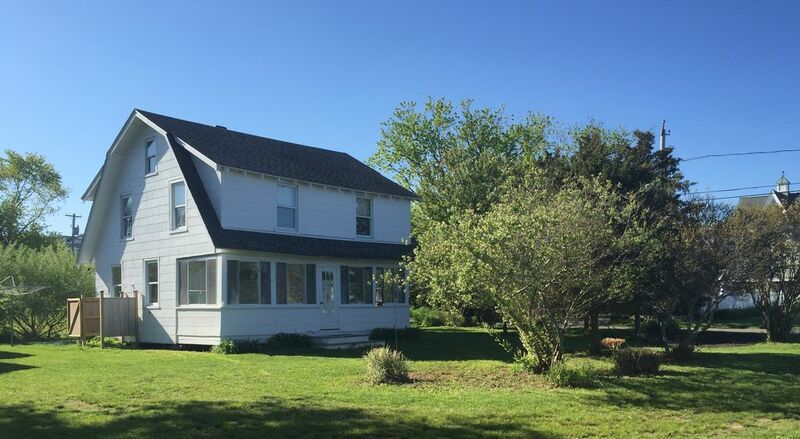 This Historic Conneticut Beach Cottage is just steps to a private beach and close to the West Warf and the Madison Beach Hotel. Welcome to our family cottage! Our charming cottage sits at the end of a quiet private road, nestled between two protected wetland areas. We are just a three minute walk from our private beach. We share a private beach with a few of our neighbors. One can legally travel under the high water mark making the entire beach accessible for beach combing, fishing etc etc. Our cottage retains much of it's original charm, but is filled with modern conveniences. We offer extras like complementary high speed internet, cable tv, apple TV, laundry , and a dishwasher. Four fully appointed bright and cheerful bedrooms include one double sized bed, and a second bedroom with a twin sized bed. There are two more bedrooms that face Long Island Sound and each have two twin beds. All of the bedrooms have individual air conditioning and baseboard heating. The upstairs has the main bathroom where you can enjoy a relaxing bath in a large claw foot bathtub. The lower level of the cottage has a newly remodeled open concept kitchen with a 10 foot Kitchen Island clad in Calacutta marble and the living room TV area. The space is surrounded by windows and is bright and spacious. The kitchen has a new stainless steel refrigerator and dishwasher. There is also a new stove built into the marble topped kitchen island with (2) bar stools for seating. Step out the side door next to the kitchen to access our Webber gas barbecue grill. The kitchen also comes fully equipped with coffee makers, a toaster, dishes, utensils, and pots and pans. It is a very enjoyable space for preparing a meal. The comfy living area is a great place to relax or watch a movie. the cottage has a large flatscreen tv with cable and a DVD player. Our family has always enjoyed eating our meals and unwinding after a day at the beach on our enclosed porch. Its one of the best parts about our cottage. Watch the sunset while having a meal seated at the large teak dining room table that can seat eight with ease. There are lovely flower and trees all around the house with many bird watching opportunities. The front yard also has a mowed area of grass we use to play bocce. The outdoor shower with hot and cold water is located at the side of the house. The one car garage also has a half bathroom combined with laundry facilities. There is a new full sized washer and dryer with a laundry sink as well. We have a large assortment of beach chairs and umbrellas, and all manner of beach toys for the kids. It's just a short walk down the road to get to our deeded semi-private beach. Grab a beach chair and umbrella and enjoy swimming and beach combing along the shore. Great fishing can be found just down the beach at the West Warf or head down to the Madison Surf Club where you will find a large modern playground and basketball courts, snack bar, and public beach. You can easily walk or bike (please bring your own) to the charming town of Madison. Take in the movie at the Madison Art Cinemas. Shop at the many boutiques, or enjoy a fabulous meal. We will be happy to share with you many of the wonderful activities Madison and the surrounding towns have to offer. This is a wonderful place to experience laid back beach living. shower, outdoor shower, Full shower with hot and cold running water. One master bathroom with large claw foot bath tub. Its minimal with the summer foliage. Individual air conditioners in each bedroom including loft. Baseboard heating throughout the house. cleaning products and dishtowels provided. Recently renovated open kitchen, with all new full-sized appliances including dishwasher. The kitchen is fully stocked with all food preparation and serving items, including toaster, coffee maker. Small deck at the back of the house near the kitchen, used for grilling and walkway to shower. If you are looking for a low key, comfortable vacation near restaurants, the beach, and quiet roads, this is the place to stay. This house is no frills, but has everything you need. The house has an outdoor shower, washer and dryer and a dishwasher. Each room has an air conditioning unit, and there is a screened in porch. In the garage has plenty of water sport equipment and beach chairs/umbrellas for you to use. We were a family of five and were happy staying here. While the house has only one bathroom with a clawfoot tub, there is a second bathroom in the garage where the washer and dryer are located. We all took outdoor showers daily. One thing we wished for was a coffee table in the living room, but outside of this, our kids loved staying here and we will be back again! A wonderful retreat for one and all. Our entire family had a splendid vacation . The town is a gem from yesteryear. The beach was fantastic. The house has everything you need to have a great vacation and escape from it all. Located on a secluded dead end street. The house sits surrounded on both sides by protected wetland. Pets will be considered additional fees apply.